Yeah, that's right. Steampunk Palin. It's not a joke. It's real. The folks at Comics Alliance found this gem, which apparently "contains fifteen pages of story, followed by eight pages of pin-ups of Sarah Palin." The story starts in the near future, in the immediate aftermath of a war that has destroyed all the Earth's oil. A new power source is needed, and Sarah Palin steps forward to suggest steam power as a replacement. A conglomerate consisting of big oil and nuclear power interests makes a counterproposal by blowing her up with a bomb at the meeting where she suggests this. Of course, that doesn't explain why Sarah Palin is half robot. Or why she has a 36DDD chest. Maybe the gears and machinery in her arms are designed to help her support her enormous cans? The book also features Robama. Obviously. At some point in the narrative, Ms. Palin dons a corset. Perhaps it's best not to wonder why. This book is bad. There's no getting around that. How bad? Well, to be honest when my jaw wasn't dropping so hard I was worried for the safety of my downstairs neighbors, I was laughing pretty hysterically at the events of the 15-page story for reasons I'm going to go ahead and assume are not intended by the authors. 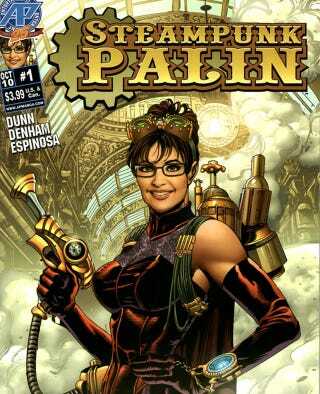 Thus, I'm not afraid to declare Steampunk Palin to be so bad it's good.